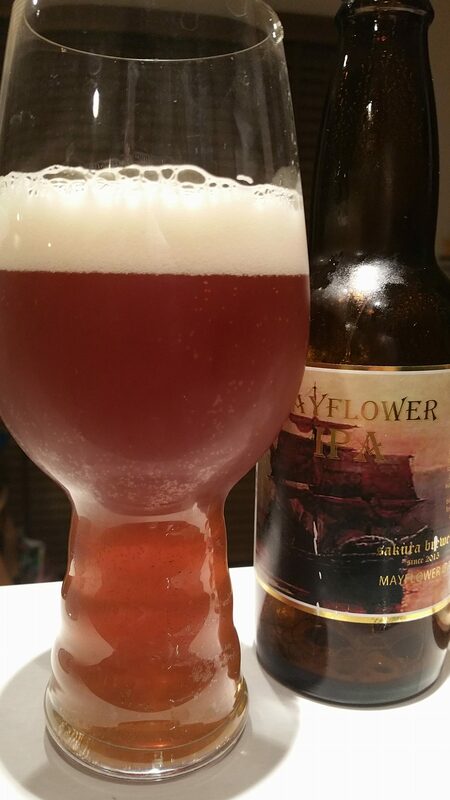 Sakura Mayflower IPA is a 7% English IPA from Sakura Brewery, based in Iwate, Japan. It started out life as part of their draft range and found its way into bottles during 2016. And that’s it – there is no information on the Sakura Brewery homepage, nor could we find anything in Japanese about the beer either. The only thing I know is that this was a present from a friend who went up to the Brewpub earlier in 2017, in Kitakami city and really enjoyed this on tap. What the heck went wrong with the bottling here?! Like Joe, I dread omiyage beers. Not that I’m trying to be demeaning or come across as ungrateful but the omiyage beer industry in Japan seems to be developing again and everywhere you go – the satellite shops in Tokyo, or the road stop shops in the deepest parts of the countryside, or even the main tourist attractions in Tokyo (Yes, you SkyTree and your Virgo beer) – there seems to be some dodgy beers going. When I got this bottle from a friend, I spent hours scouring the net to try and find something about it. It’s not a lager so clearly the brewer must either be a well-travelled drinker from Japan, or perhaps a foreigner living in Japan (it’s the second one after much searching). Sakura Mayflower IPA poured out a deep copper colour with a large frothy white head on top, with large soapy bubbles that faded quickly into the class. My friend had this on tap at the Ale House Robin Hood in Kitakami (A British pub in Iwate?!) and loved it but clearly we had a different beer going on. Sakura Mayflower IPA smelt like a butterscotch bomb with no hints of hops. It didn’t smell anything like a British, or come to think of it, an American IPA at all. I really did wonder what my friend had been drinking or if he had been absolutely off-his-rocker drunk and didn’t really remember drinking this. The closest analogy to Sakura Mayflower IPA in terms of off flavours would be like drinking a bottle of paint stripper – the peculiar flavours going around in this beer just didn’t do it for me. At least is was bitter but then that could have been a sourness to it. Something had clearly gone wrong with either this batch of beer or the bottling process as Sakura Mayflower IPA was a struggle to finish when chilled. When it had warmed up though, the off-flavours were more pronounced and turned it into a drain beer. Perhaps Sakura Mayflower IPA had an off day or the bottled version had some issues but I can not recommend it at all. P.S. As much as I loathed this beer, my friend is still my friend. Just.